The coin was issued to promote the idea of peace and solidarity. The design is simple and effectively represents the idea it was intended to. It was created by a school student. Two children are shown holding the Maltese flag with the dove of peace flying over them. At the bottom is the name of the issuing country ‘Malta’ and at three o’clock is the year of issue - 2017. 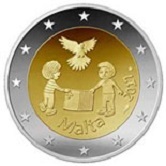 This is the second coin of the five-part series "Children with Solidarity".